I did not pay attention to the article that I had read 2 years ago with the topic on how to make an MLM blog. The author was discussing how he is getting 10-20 interested people a day emailing him sending an inquiry about the business. I did not start my own MLM Blog that time because I think blogging is too difficult to do. After I started my own MLM blog, I realized that I should have started earlier. Making a blog is not as difficult as I used to think before I started. I could have more MLM leads inquiring about the business if I just started in the year I have known about it. But still, It was the best part to start than never. Today, you are lucky because I will tell you the MLM blogging Secrets. How people will contact you and inquire about the business to ask how they can join. You, not chasing them. Why should you do an MLM Blog? Or should I say, an online home based business blog? I mean to say, finding the right prospects even at home. Let me make it a real clear. If you plan to do MLM blogging or starting a Network Marketing blog, it will take time before you can make a real number of people contacting you and you have to work on optimizing your blog too. This is not an overnight strategy that you will start this night and inquiries will be flooding your inbox when you wake up. Not even within a month. Blogging is a real journey but offers a great potential. 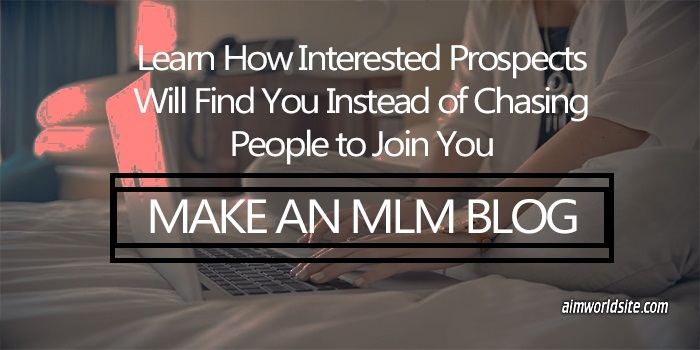 Before starting your MLM Blog journey, think what lies ahead and think again if you are willing to take the chance. Your effort and dedication will say how long you can gain good results. Don’t be afraid to try or to fail. Not trying gains you nothing anyway then try it instead. I can see other blogs or website from other distributors and I can say that they are simply not doing the right thing. Their blogs seem to be a ghost town. I can’t find an effort on building their value or their authority. So it answers why. 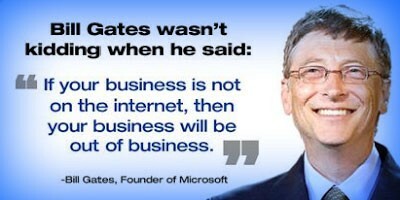 We are in an online era, how do you maximize the power of your internet? Curious people are always on google typing what they would want to know if they seek no help from someone. Many people are hearing about the good opportunities or even searching for the good opportunities that they can get in and if they can ask no one, they go to google. You and I are aware of the importance of google search and I will bet that you already used it too. 🙂 How do you plan to capture these interested people that go to google to learn more about your opportunity? This innocent MLM blog of aimworldsite.com is receiving an average of 10 inquiries every week either to my Whatsapp or through my Email address. Oh, I have my Facebook page too and I am also putting my Facebook profile to some of the posts so I will include those people adding me or messaging me to the count. Today, I am having an average of 15 inquiries every week but of course, this started from nothing before I reached this number. Things will work out if you put more work and more effort. At the end of the day, you will say that it is worth it. I can vision that the inquiries will double too in the coming 3 more months that will also increase the actual pay in. And the most exciting part is… This blog just started in July of 2016 and the traffic or visitors of this blog is increasing gradually. That also means more people are seeing the opportunity on every month passing by. It started from 50 visitors per day but since I am consistently doing my best effort to make more informative posts, it is growing exponential. Numbers won’t lie. I already got some numbers on the visitor counter and the flag counter after 8 months so it is reasonable to have a percentage of it that will inquire and contact me. This is just the beginning and the best is yet to come. Do you know what excites me most? I am excited to have 10,000 page views per day on my website. That can happen in a year and it continues to grow as my website or this blog gain age and popularity. Google will rank my blog to more keyword searches as time goes. I can imagine that on every topic that a prospect would want to know about my opportunity, my web page is always on the top of the search results ready to feed an information with my contact number. This is not all about me, but this is all about you starting the MLM blog as soon as you can. I just showed you the potential. People love to share, and that gives you a free advertising. Once you created a blog, never miss putting a share button for social medias. Most of my blog post are having an average of 300 Facebook shares and that gives me 60-70 percent of traffic. Most MLM people will simply share a content even without reading the whole content. The title is enough for most of them to catch their attention and share not knowing that the post has a contact number at the bottom of it. Make an MLM blog and the journey will start by choosing the right domain name. » yourname.com – Here you will not mention any opportunity that you are in. You should build value and be an authority in MLM. What to blog about? – MLM tips and your expertise how to do network marketing. Hundreds of MLM people are searching for the MLM tips that can help them grow. By giving them a guide can make them a choice to join you instead. 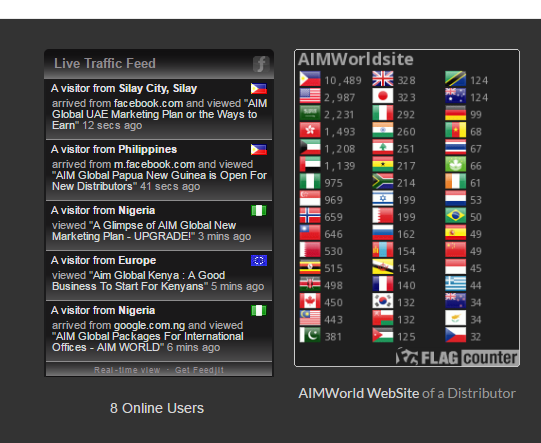 » networkmarketing.com – (this is just an example) Like my domain as aimworldsite.com. Here you can post about the guide how to join your business. What to blog – Post all related topics about your opportunity. If you are engaged in an amazing opportunity, why not make a post to guide people and share what you know. Someone out there is actually hearing about your company and they want to know about it. Still bring value! Don’t just put a stupid post with less than 300 words but bombarded with join now words. Learn how not to do the hard way of recruiting but providing value first. I am not a good writer nor a web designer yet I can make blogging and make prospects find me. I hope you will not let more time to pass by before realizing that you should have started earlier. Lead instead of being led. If you start in 2020, someone could have already dominated your potential market and you are justing starting and on the learning curve. But what if you start now? I don’t know about you but one thing I am sure, the idea I shared with you is one of the greatest strategies that you can ever known in MLM history.